prevent you from giving your body what it needs. From the comfort of your chair, wheelchair, or scooter. 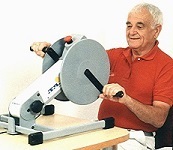 Active – exercise muscles against the motor’s resistance. 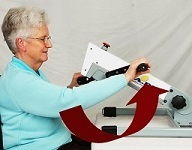 Passive – motor driven movement. 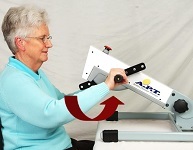 Exercise Actively with motor assisted movement. M.S. (Multiple Sclerosis), and C.P. when situation has improved – switch to a larger radius, larger range of motion. you have all options you need, already built in. A Quick and Easy release system means – no tools needed to change size of radius. Michael was in a car accident that left him in a coma for months. He never gave up. 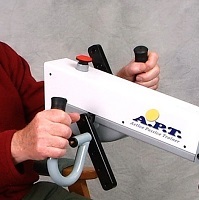 “I can now walk with assistance with a quad cane up to 15 minutes with no breaks. I attribute this to my daily exercises using my APT. 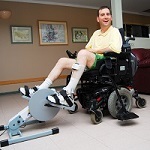 The APT Trainer allowed me to build the necessary muscles within my body.